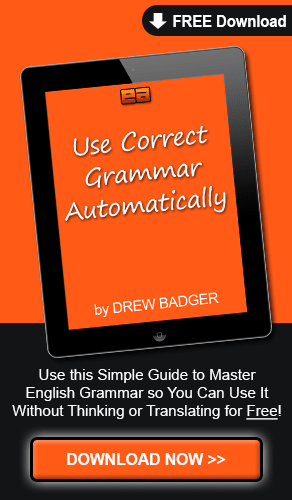 Learn causative verbs visually in this English grammar video lesson! 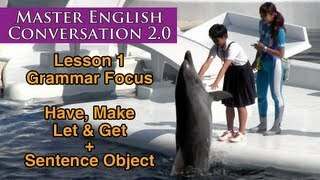 In this Master English Conversation Grammar Focus lesson, learn causative verbs (let, make, have and get) and combine them with sentence objects so you can use them in conversations automatically. 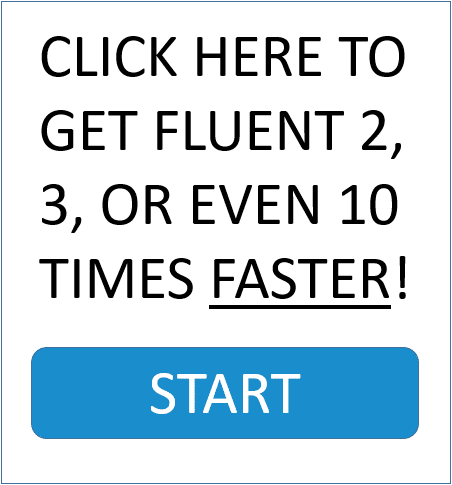 Causative verbs help you ask, tell or command others to do things, and if you learn causative verbs visually, you’ll master them faster and be able to use them in your conversations without thinking much more easily! Welcome to a special preview of Master English Conversation Version 2.0. Well, hello and welcome to your very first lesson in the new Master English Conversation Version 2.0! I’m really excited to change things around to make the program even better. as I’ve been talking with subscribers and friends and students about how to make the program better. uh, in this month’s lesson set. First, just a very quick introduction to how the new lesson set works, so you understand everything. The first lesson set is this one. kind of, Time Traveling lesson so you can practice it in many different ways. is we’ll have the conversation last. I really want to prepare you for the native English by practicing individual things first. all about what you need to know in order to prepare you for the real conversation that happens in the Master Class video. and the Special Mission Homework Assignment together. So, for this lesson, we will focus on the grammar. is that I will introduce a grammar point that you will see a lot of in the conversation. and I go back over the conversation and find something that appears a lot, and it could be tricky. So, I take that and then introduce it first. So, we practice the grammar. You can SEE how the grammar works. You can really get better and understand the grammar. And then, when you’re watching the actual conversation, you’ll hear, “Ahhh! I remember that! And it will be the same thing for the Fluency Corner lesson and also the phrase practicing, Phrase Builder lesson. for the real conversation and you can really enjoy it much, much more. and I really want you to listen to specific grammar point. And this grammar point is four things that are very similar, but their meaning is a little bit different. So, we will go through all four of these individually, and you will understand how to use them in conversations. The coach has his team listen to a new basketball game play. The coach has authority and the team has no choice, but the coach is nice and polite. This girl wants to talk on the phone. She doesn’t want to clean up her toys. Her grandfather is older, and much bigger, but he gently has the girl clean up her toys. To be a bit stronger with children, you can make them clean their room. Also, you can have someone do a simple task if you’re kind and nice. His players are not listening, so he’s making them do push-ups. The players have no choice. They are being made to do push-ups. Respectfully, you have someone do something. Forcefully, you make someone do something. I’m not making you watch this video. This man is feeding his dogs. He chooses to feed his dogs and he’s making them wait. The dogs have no choice. They want to eat, but the man makes them wait. Now, he’s letting the dogs eat. He’s giving permission to the dogs. I wanted to play basketball, so I asked a team if I could practice with them. They chose to let me practice with them. A girl was playing a game, but her brother wanted to play. She was very nice and let him play the game. It was her choice to let him play. A boy wanted to watch TV, but his grandfather wanted him to do homework. The boy did not want to do his homework. The grandfather asked the boy nicely to do his homework, but the boy kept watching TV. The boy didn’t listen, so the grandfather got the boy to do his homework with money. The grandfather paid the boy and got him to do his homework. You can get someone to do something by asking, paying or even tricking them. It’s the other person’s choice, so you have to get them to do something however you can. Now, listen for examples of get, let, have and make used in a native English story. This story will be told in three different tenses. The first tense will be the past. My boss had me travel to Kyoto for business, so I couldn’t fix our washing machine. My wife wasn’t upset, but she made me promise to bring back her favorite snack. During my trip, I got my friend to take me to the aquarium. He had special tickets and let me go with him. The new aquarium was really interesting and the dolphin show was great! The trainers made the dolphins do many different tricks. They got the dolphins to perform with fish. The dolphins were made to jump and swim. In the middle of the show, the trainers got two women from the audience to participate. The announcer let the two women come on the stage and had them introduce themselves. Then the trainers let the women shake hands with a dolphin. I was really surprised that the dolphin let the women do that. Here’s the same story happening in the present. My boss is having me travel to Kyoto for business, so I can’t fix our washing machine. My wife isn’t upset, but she’s making me promise to bring back her favorite snack. During my trip, I’m getting my friend to take me to the aquarium. He has special tickets and is letting me go with him. The new aquarium is really interesting and the dolphin show is great! The trainers make the dolphins do many different tricks. They get the dolphins to perform with fish. The dolphins are made to jump and swim. In the middle of the show, the trainers get two women from the audience to participate. The announcer lets the two women come on the stage and has them introduce themselves. I’m really surprised that the dolphin is letting the women do that. Here’s the same story happening in the future. My boss will have me travel to Kyoto for business, so I won’t be able to fix our washing machine. My wife won’t be upset, but she’ll make me promise to bring back her favorite snack. During my trip, I’ll get my friend to take me to the aquarium. He’ll have special tickets and will let me go with him. The new aquarium will be really interesting and the dolphin show will be great! The trainers will make the dolphins do many different tricks. They’ll get the dolphins to perform with fish. The dolphins will be made to jump and swim. In the middle of the show, the trainers will get two women from the audience to participate. The announcer will let the two women come on the stage and have them introduce themselves. Then the trainers will let the women shake hands with a dolphin. I’ll be really surprised that the dolphin lets the women do that. Did the announcer make the women come on the stage or let the women come on the stage? She allowed them to come on the stage. They had a choice and were asked. The trainers made the dolphins swim, right? You can use “have” here to sound more polite, though. Did the dolphins let the trainers ride on their backs? The dolphins did NOT let the trainers ride on their backs. Did the announcer have the two women eat fish? She had them introduce themselves. How did the trainers get the dolphins to jump? The trainers got the dolphins to jump with fish. They got the dolphins to jump by giving them fish. and listen for them in this month’s Master Class video lesson.